Candidates who are waiting for the Tumkur District Court Hall Ticket 2019 can get the complete details on this page. The Officials of Tumkur District Court announced that Tumkur District Court Admit Card 2019 will be released in the month of March 2019. We had also inserted the direct link to the bottom of this page. The officials of the Tumkur District Court announced that the Tumkur District Court Examination Date will be in the month of March 2019. Aspirants who applied for the Stenographers, Process Server, Peon posts will only get the admit card. You can download the admit card directly from the official website @ districts.ecourts.gov.in/tumakuru. In the below sections of this page, you can get the overall details regarding the selection process, mandatory documents to be carried, steps required to download the admit card, information available on the hall ticket. Aspirants who have filled the application forms are eligible for the examination. To attend the exam, all the students should carry their admit card with them. The aspirants without the hall ticket are not allowed to write the exam. Furthermore, the exam date is scheduled for the month of March 2019. Students will receive the admit card a few days before the examination. You can also know about the Tumkur District Court Selection Process 2019. The selection process mainly consists of two steps which are as below. While attending the examination, students need to carry some mandatory documents to the examination center. These documents are needed for the security purpose. So, aspirants are advised to take any one of the original documents as proofs for the exam. List of the documents is given below. Open the official website of Tumkur District Court at districts.ecourts.gov.in/tumakuru. You will see the home page which is displayed on the screen. Go to the announcement section on the home page. 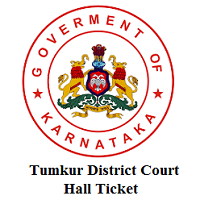 Find the Tumkur District Court Hall Ticket 2019 link in that announcement section. Click on that link, then a login details page will be opened. As per given information, the Hall Ticket will open. Take a print out of hard copy and carry it for the examination. Check our FreshersNow page to get all the updated information.